She chided herself for even having that thought. Of course, something must have come up, something important. He had responsibilities, people depended upon him. He would have come if he could have…tonight of all nights…. Catherine surveyed the array of partially melted candles, puddles of wax filling their holders. Reluctantly, she began to blow them out. It was 3:00 a.m., long past the appointed time of their celebration. Their third anniversary. Catherine had had such hopes for this evening. Sighing, she bent over the last, lonely flame, preparing to end its life with a puff of air. She stopped in the act of pursing her lips and regarded the glowing candle. So brave, so bright, it carried on when its brethren had been snuffed out, willing its light into the inky blackness of the night despite being alone. She couldn’t reward that determined little flame with oblivion. Smiling, she straightened and carried her stalwart companion into the apartment, placing it on the glass-topped dining room table to allow its flickering light to reflect and be magnified there. The candleglow rekindled the warmth within Catherine’s heart. This was what Vincent had given to her, or perhaps more accurately, what he had nurtured within her - this steadfastness in the face of gloom, this resolution despite the odds. She who had shied away before when situations or people got too difficult had, through Vincent’s example and encouragement, learned to become like that shimmering candle flame. She had taught herself to stand fast, to try to be a light in another’s darkness, to give warmth without expecting it in return. Vincent had been the candle for her in her darkness that night three years ago. In her temporary blindness he had lent her the radiance of his own bright spirit, and its luminosity had sustained her in the shadows of despair and pain. And every moment since that time, she had held that graceful spark close, its warmth a constant presence in her heart. Perhaps it had been their Bond, immersing itself within her even then. She didn’t know. But the one thing she was sure of was that Vincent’s lonely candle flame had lit a corresponding spark within her. Delicate and fragile at first, those flickering points of light had reflected each other and had grown in strength from that reflection. And now…well, perhaps he had missed their anniversary, but it didn’t matter. He was with her always, his light filling her with love. Keeping the candle company, Catherine pulled out her calendar to plan her week. She noted she was scheduled for a shift on the suicide hotline on Monday night, and she had made plans with Edie to catch up while volunteering at the homeless shelter soup kitchen on Saturday morning. A flyer was stuck inside her calendar to remind her it was time to contribute again to the local food bank…. In the midst of her planning, she considered how different her life was now than it had been on that April night three years before. What a difference love had made in her life; Vincent had not only saved her life, but his kindness to her, a stranger, had kindled within her the desire to lighten others’ burdens in any way she could. She was only one candle in the darkness, but by sharing the light with others, she had found that the world could be a brighter place for everyone. Shaking with spent emotion, Vincent folded the begrimed, careworn hands across the old man’s chest. Death was never easy. Witnessing the fire go out, the spirit flee, was a hard thing. He leaned back against the trunk of the massive evergreen under which he had sat vigil for hours with this man, a stranger, whose light had been extinguished by time, neglect and disease. Who had he been? What had his life encompassed? What had led him, at long last, to this place, this moment? Vincent wiped away his tears and looked around. It was still deep night, but within a few short hours Central Park would be stirring with life. Before the first tendrils of dawn would stroke its treetops, early risers would be jogging, the homeless would be moving from their temporary cover…. Yet the body might not be discovered for some time, hidden as it was. He himself had nearly passed the old man by as he made his way to Catherine’s on their special night. The barest hint of sound, perhaps a rustle in the leaves, perhaps a sigh, had alerted him to the stranger’s presence. Vincent had sensed only the merest flicker of life within him; he had been beyond help even then. But Vincent could not abandon him to a lonely death, so he had crawled beneath the cover of the trees and sat with the man, holding his hand and talking to him so he would know he was not alone as he embarked on his final journey. Now that the old man had expired, Vincent wondered how to ensure he would be found. The path was not too distant. It would be a simple task to lift him and place him on a nearby bench. That was what he should do, and soon, before waking eyes could catch the movement. Yet strangely, he was reluctant to leave the sanctity of this place where moments before a life had extinguished itself between one breath and the next. So he sat a while longer, extending his vigil, and his thoughts turned from death to life…to Catherine. How differently things had turned out tonight, exactly three years since the night he had found Catherine, bloodied and discarded, in a ravine not far from this place where he now sat. Unlike this night, when he had detected the barest glimmer of life left within the frail chest of a dying man, the spark within Catherine had been brilliant, a fiery beacon in distress, drawing him instantly to her side. As it began to fade, his apprehension had blossomed, and his initial intention to place her where someone would find her vanished under the necessity for more immediate action. He thought back to the time she had spent Below with him, healing from her physical injuries. He had felt that her despair was causing the gentle light within her to waver, guttering slowly as a fire ebbing into embers. Despite Father’s warnings to maintain a doctor’s detachment, he had found himself inexorably drawn to that fading light, feeling an overwhelming need to inspire her to rekindle it, understanding intuitively how deeply the flame would burn if he could. Her light had drawn him since that time. The purity of it, its grace and its passion enveloped him, beckoned him to its warmth. That light had filled him, banishing the darkness, renewing him. She had filled his life, his world, with the shimmering glow of her love. Tonight should have been a celebration of their shared light. Instead, he knew he had disappointed her. Catherine had kept the candle company as it burned down. It was barely a lump of wax now, its tiny flame sputtering. The clock read 4:30. Outside she could discern the lightening of the darkness as day once more beat back the night. She felt her conviction grow that light was stronger than shadows. It might fade for a time, but only to gather itself, to reinforce its strength before bursting outward and bathing the world in its glow once more. She glanced from the sky back to the candle and watched with a glimmer of sadness as the flame wavered and finally died. Just then she heard a distinct knock against a pane of glass. Rising with surprised delight, Catherine rushed to the French doors and threw them open. Vincent had come at last. No longer was she saddened that they had missed the opportunity to celebrate on their special day. Truly, every day, every moment was special with his light in her life. “I can only stay a moment, Catherine,” he murmured. “Both of us had other plans on the night you found me,” she reminded him. 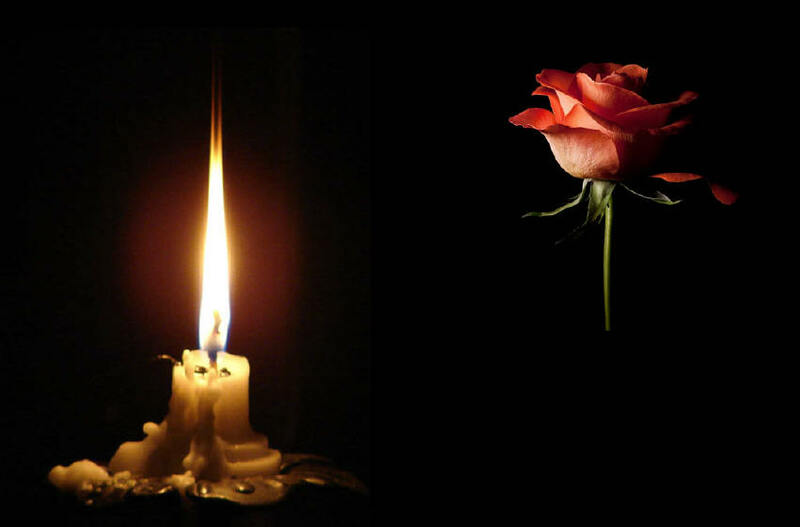 “I have a candle or two inside that I was saving to light when you arrived. Come inside and light them with me?” Her eyes, heavy-lidded, hinted at the subtext of her words.